Playing DOOM on Switch feels like a strange dream. The game brings an intensity not usually found on Nintendo platforms, with the over-the-top action being a major selling point. It’s a heart-pounding experience and one that impresses on so many levels. As the first major FPS released on Switch, DOOM is a must buy for fans of the genre and absolutely worth a look for anyone looking for an excellent action game. One of the first things that stands out about DOOM is its focus on the single-player campaign. This robust 8-10 hour narrative can be enjoyed in several different ways. 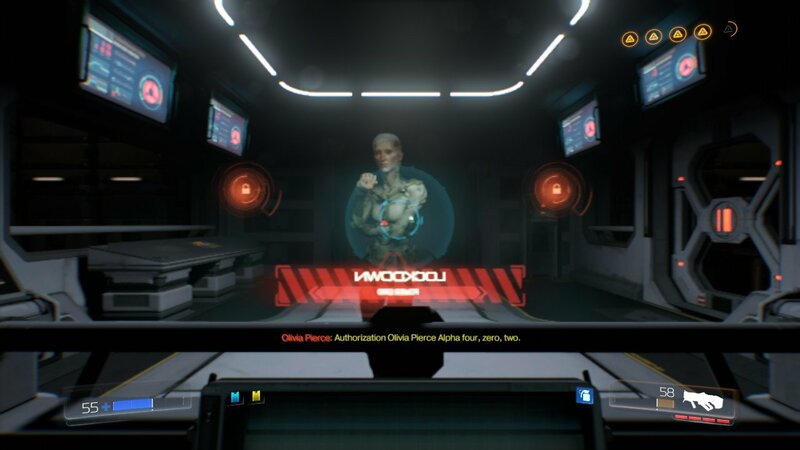 Its standard mode lets you play through the campaign normally, completing a few big objectives meant to quell the demonic presence on Mars in each stage. There are 14 stages to traverse, while each level provides new challenges, weapons, and secrets to keep the gameplay fresh. While a compelling narrative isn’t the reason most people buy Doom, the story you’ll experience actually does have some depth to it. I really enjoyed finding codex entries that added to the larger narrative and universe. If you’ve played the Arkham games and enjoy reading through bios unlocked by finding Riddler trophies you’ll find that same thrill here. I was shocked to see just how much there is to do within each level. From the little that I knew about DOOM before playing it, I assumed there would be only a few hours of content that focused entirely on scoring gory kills on massive demons. While there’s more than enough demon slaying to enjoy, slowing down and exploring the world around you yields many secrets. Hidden rooms are everywhere, and they are difficult to find. Each contains different things, some collectibles to fill out your gallery and others suit upgrades that make your romp through the world easier. They’re worth looking for, and I have yet to find about half of them in each stage. The presentation deserves commendation as well. 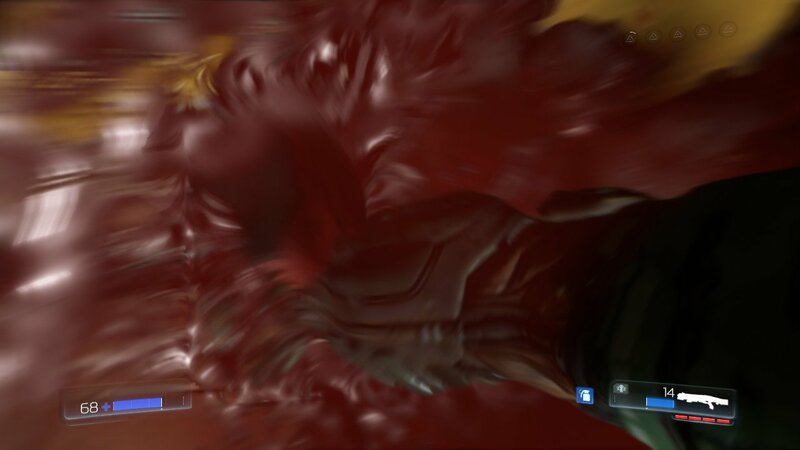 The second you start playing DOOM it feels different. The gritty visuals, detailed environments, and dark overtones don’t come around on Nintendo devices often. Nintendo systems have been my favorites for decades, and it always frustrated me that games like this couldn’t be played on their platforms. The second Doomguy woke up in his chamber, a dank lab with a few weak demons ready to be blown up into bloody puddles, I felt confident this would be an experience I’d remember for a long time. Graphically, the looks pretty, especially in handheld mode. The game runs at 720p@30fps in both docked and the handheld mode. You’ll notice some blurry textures in the background when playing on the big screen, but the Switch’s smaller screen masks those blemishes well. There were a few moments where I’d get frustrated an endless chasm that looked a whole lot like ground with steam coming out of it early in my adventure, but after a few leaps to my doom, I learned my lesson. Later in the game, when tons of demons are on screen, the frame rate does occasionally drop, but it never affected my enjoyment of the game. Panic Button deserves a lot of credit for getting a game this detailed onto the Switch. You can definitely tell this isn’t running on an Xbox One X, but while frantically shooting for your life you won’t notice the lower resolution. You can also experience Arcade mode, which thrusts Doomguy (or Doomslayer) back into the normal campaign but with a twist. 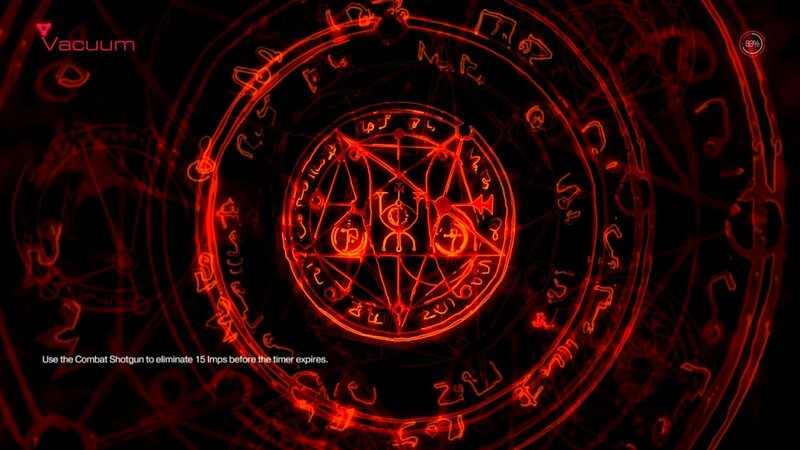 This time your goal is to get a high score, done by killing crazy amounts of demons in a fast and flashy manner. Multiplayer is here as well, but it didn’t really hook me like the main campaign did. I’m no tech guy, but I feel like the resolution drops big time when you’re playing multiplayer. The impressive visual polish found in the campaign wasn’t there when I took my game online. Still, the gameplay is fun enough and there are so many modes to enjoy. You can also play against bots to practice, a nice bonus for the less skilled. The single-player campaign also has hidden rune challenges that put your skills to the test! Take this with a grain of salt, I’ll be the first to admit that first-person shooters aren’t my strength, but I felt DOOM was really challenging. For players like me, there’s no shame in setting the difficulty to easy for the best experience. 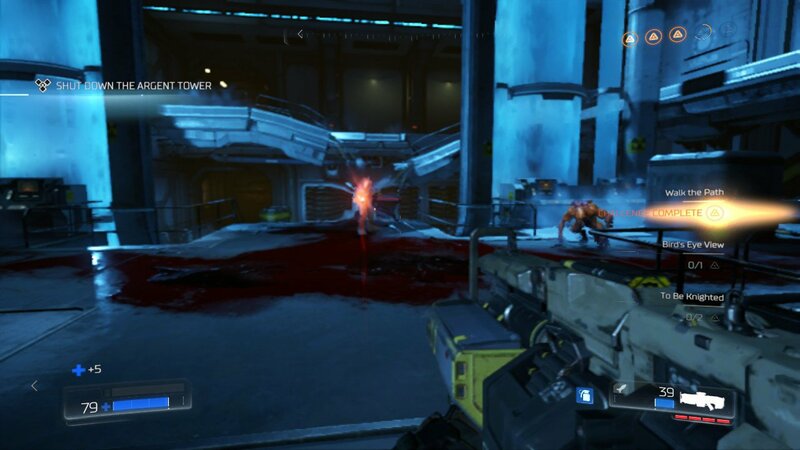 I enjoy a challenge, but one of DOOM’s more frustrating elements is its somewhat unforgiving checkpoints. It can be frustrating to die and get set back a few minutes, especially when those few minutes spent getting back to where you died usually involve just walking. The game saves after every big battle, but I think it would be best if it saved before as well. When a giant demon rips my head off I want to jump right back into it and try again, not take a long walk of shame back to the battlefield. Still, that’s a small gripe in a game that otherwise is phenomenal. With Christmas shopping in full swing, I would definitely recommend considering DOOM as a big third-party Switch game for your wishlist. It’s just about nonstop action, with addictive gameplay that rewards fast reflexes and quick thinking. FPS fans will find a lot to love here, but DOOM is more than just another shooter. It’s an action game at its core, and I highly recommend it to anyone who enjoys a heart-pounding experience. Review Disclosure Statement: This copy of DOOM was provided to us by Bethesda for review purposes. For more information on how we review video games and other media/technology, please go review our Review Guideline/Scoring Policy for more info. DOOM does more than fill a niche currently unoccupied on Switch. It’s a standout shooter that blurs the line between fps and action game. With a detailed campaign and plenty of additional modes to keep you coming back, DOOM is more than worthy of a place in your catalog.